Novak Djokovic tonight defeated Rafael Nadal in the final of the World Tour Finals, an appropriately forgettable match with which to conclude a tournament that one suspects is already evaporating from the collective memory. It was the third time in the last four years that the top two players have closed out the ATP season, but the first time it has been these two. I suppose it had to happen eventually, since they seem to have played finals everywhere else. Consequently everyone knew what to expect, especially given the surface: an extended defensive slog based around the repetition of readily identifiable patterns. As with minimalism – which people persistently confuse with simplicity – great complexity is achieved by the re-iteration of basic blocks, not to mention great length. No one expected it to be simple, and no one expected it to be quick. I confess to feeling some relief when everyone was proved wrong, at least when it came to length. When two-players face each other thirty-nine times – an Open era record – it’s inevitable that not all of their encounters will be classics, although one hoped that the last match of a memorable season would turn out to be a bit less forgettable. Alas, Nadal commenced nervously and never entirely settled. Meanwhile Djokovic was fierce initially – tearing out to a 3/0 lead – then meek for a while, and then forceful all the way until the end. He seemed to hold break points in most of Nadal’s service games, but only reciprocated the favour once to be broken back in the first set. Whatever hope this kindled of a competitive match was lessened by the consideration that the quality wasn’t high enough that you’d necessarily want to see more of it, then doused entirely when Djokovic lifted again. The point with which he re-broke Nadal to claim the eighth game ranks among the finest defensive efforts I have ever seen, a masterpiece of thrust, parry, loft and touch. Djokovic’s bellow afterwards was long and lusty, and certainly justified. Most of us will never doing anything nearly so masterful in that atmosphere for those stakes. Djokovic broke early in the second set – more shouting – and threatened to do so repeatedly as the set wore down. Insurance breaks are nice, but aren’t necessary if you never face calamity (much like all insurance, really). The Serb was never again threatened on serve, rarely conceded the baseline, and ended up with atypically excellent numbers at the net. Nadal was almost always on the move, and even when he could set his feet on a forehand found it hard to shift his opponent for long. The length on his groundstrokes was a constant problem, except for Djokovic. In truth Djokovic was the real problem. Afterwards Nadal conceded that his opponent had simply been too good. On this surface, playing at his best, Djokovic truly is. The homogenisation of the court surfaces has helped ensure that these two end up facing each other at nearly every tournament everywhere, and that when they do they barely have to alter their basic game, but between them the surface still matters. Nadal is better on clay, and Djokovic is superior on hardcourt, assuming both men play at their best. In both cases the gap is closing, but it is still there. Since the beginning of his career, Nadal fading through the late part of the season has come to feel like a structural requirement of men’s tennis, although it says a lot about his magisterial 2013 season that losing in the final of the year end championships can be construed as a let-down. It is also a testament to his evolving mastery of all surfaces that one’s definition of ‘late’ has had to be pushed further and further back as the years rolled by. Initially that late part of Nadal’s year kicked off very early, once the main clay tournaments were over. Admittedly that was long ago, when he was very young. Soon he learned to commence fading after Wimbledon, with the results petering out by the US Open. In 2008 he became a factor in the later stages in New York, and has never since failed to reach at least the semifinals, assuming he turns up at all. Yet the period after the year’s final Major – pollen-choked Australians find it difficult to call this the ‘fall season’ – has remained unaccountably lean. In his entire career he has won just two titles after the US Open, and one of those was in 2005 in Madrid, enabled by an extravagant collapse from Ivan Ljubicic. That remains Nadal’s only indoor title, since the Ariake Coliseum roof remained open through his Tokyo title run in 2010, his only other career title in what northern hemisphere fans obdurately refuse to term ‘the Australian Spring’. But this year one could be forgiven for assuming the usual rules don’t apply, especially on hardcourts. Up to and including the US Open Nadal hadn’t lost a tournament on that surface. After that he contested four events – the same ones as Djokovic – and for all that he seemed more determined than ever to secure the few important trophies that have eluded him, didn’t win any. That’s nothing to be ashamed of, of course. Winning these things is really, really hard. 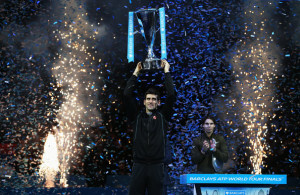 Djokovic, of course, won them all, though in the process lost his number one ranking. The extent to which those two events are connected is open for debate. Some felt that losing the top spot firmed his resolve. There’s probably something to this. After a strong start to the year Djokovic’s form grew patchy, even within matches. Transcendent sets would be interleaved with uncharacteristic dreck, as he would unaccountably lose his way. Since Beijing however these periods have grown fewer – there was a bizarre one in the Shanghai final – and he has looked more like the Djokovic who swept through the first two thirds of the 2011 season. (Surgically combining the first part of his 2011 season with the last part of his 2013 yields a year of near-perfection.) One shouldn’t forget he almost did exactly the same thing last year, but for that strange loss to Sam Querrey in Bercy. Last year he was chasing down Federer for the number one spot, successfully as it turned out. Grand purpose certainly sharpens his focus. On the other hand, it’s probably pointless to search for additional reasons for Djokovic to play superbly on hardcourts. At his best he is without question the world’s best player on that surface. His current streak of twenty-two matches isn’t the longest by any means, but it is unsurpassed for quality. It includes twelve victories over the current top ten (aside from the injured Murray), including two wins each against Nadal, Federer and Wawrinka, and eight in less than two weeks. That’s hard to top. The appropriately renamed Brad Drewett trophy, bedecked with blue streamers and bestowed amidst a blizzard of confetti, was a fitting reward. Thus ends the latest edition of the World Tour Finals. It certainly wasn’t the most memorable instalment, from any point of view. Perhaps it was the absence of Murray, but the entire week has felt slightly deflated. The Sky Sports commentary was certainly less demented as a direct result. Recall their tedious tut-tutting during last year’s semifinal over the London crowd’s divided loyalties, particularly Sir Ian McKellen’s unforgiveable decision to sit in the Federer box. Sir Ian was nowhere to be seen this year. No doubt he’s hewing monsters in Mirkwood. One wonders whether Murray’s absence was a deciding factor in keeping other celebrities away. Last year there was a cameraman tasked with capturing Kevin Spacey’s every facial tic, and apparently no one could get enough of Pippa Middleton. This year there were endless footballers and one of the heinous mannequins from One Direction. Still, you can’t have everything. Thank you, Jesse, for those delightful articles to complete this year’s WTF experiences… I also deeply admire your genius for titling them! New that the season is over and Summer is approaching, I’m told, in certain blessed areas of the planet, it is time for all of us, tennis passionates, to catch up on sleep, to prevent ourself from becoming too involved on the Challengers and Futures circuit and to honor some neglected aspects of our daily life… Let us En-Joy! Thanks, Eva. Sometimes I wonder if anyone even notices the titles, so I’m glad you do. You’d be surprised how long I sometimes spend on them, only to change them later. Don’t forget the DC final this weekend! No rest for us. Thank you, Natalia, on all counts. I happen to play both those Nocturnes, and the Beethoven sonata that was in the related links.